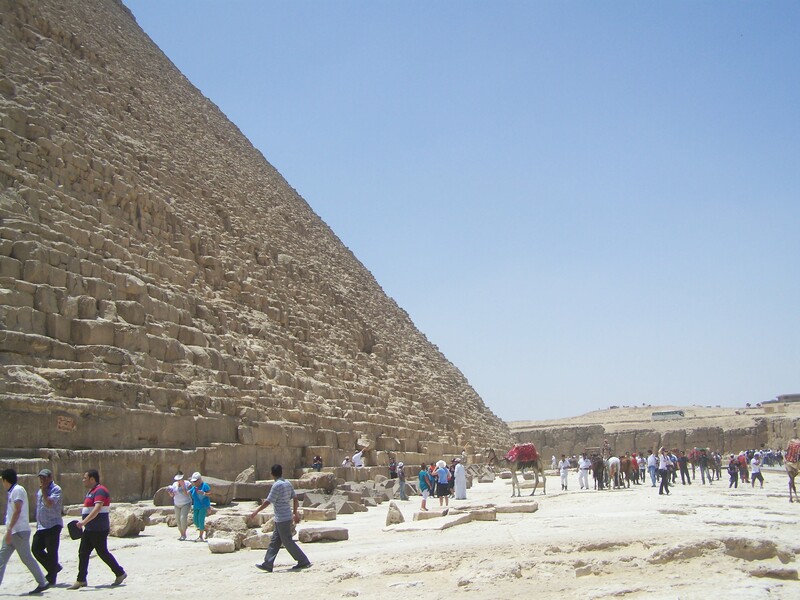 Tourists at the base of the pyramid, like ants at an ant hill! The City of Alexandria is a modern day port city once the capital of Graeco-Roman Egypt and the learning center of the ancient world. The Pharos Lighthouse, one of the Seven Wonders of the Ancient World, once stood here. It was founded by Alexander the Great in 332 B.C. 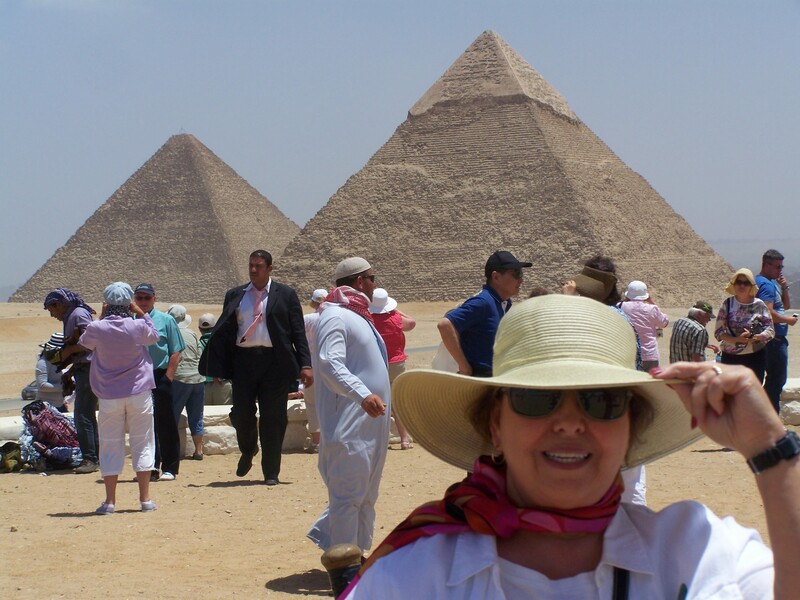 I’m still speechless – our excursion on Friday, May 10, through Alexandria to Cairo, anticipating the experience of the Pyramids of Giza, the Sphinx, and the Mosque of Mohammed Ali, was a trip back in time. The tour guide with our bus was an expert on all things Egypt. Her expertise on our tour, along with the photos we took, will make a long lasting impression and many good memories. Our tour guide warned us about the souvenir vendors before we arrived at the pyramids, so we could be prepared, but even that warning did not help. The only unpleasant experience of the tours was the relentless pursuit by the vendors, even when we said a firm “no.” We paid for photos with a camel (on our own camera), a few small souvenirs, but other vendors never gave up. It’s a poor city with more than 30 million people, so this explains their desperation. But nothing prepared us for the overwhelming size and majesty of the pyramids! Or the mystique of the Sphinx! We walked inside the Sphinx temple among the many tourists, like little ants on an ant hill…it is just so surreal! Lunch aboard The Pharaohs, a unique riverboat on the Nile River was also surreal and a very pleasant surprise. I don’t know exactly what I was expecting, but this boat and river cruise for lunch did not disappoint. It was a buffet lunch, including dessert with coffee and tea. We enjoyed entertainment by local folk dancers, including a whirling dervish and a belly dancer. Views of Cairo from the Nile River were like no other…it made the city a lot more photogenic! Imagine, we actually were on the River Nile in Egypt…the cradle of civilization! Two more exciting stops along the way included the Mosque of Mohammed Ali, where his tomb is found; also, the Merit Papyrus Shop, where we saw a demonstration of how papyrus paper is made, and scouted out souvenirs. We are resting on The Mariner of the Seas in the Port of Alexandria today, after that long day’s excursion (13 hours) yesterday, Friday, May 10! Some cruisers are touring more of Alexandria today. Tonight, we will celebrate our impending arrival into the Suez Canal in the wee hours of the morning (1:00 a.m., May 12). We will leave the Mediterranean Sea and tomorrow we will be in the Red Sea…how exciting is that? Just the name “Red Sea” brings all sorts of biblical history to mind. Find the link for Trilla’s Travels at http://www.ourtribune.com. ← An update on our 41-day Trans-Atlantic cruise to date! Trilla, your comments are wonderful. I have always dreamed of making the trip to Cairo to see the pyramids and other attractions…..I will probably never get to. But through your travels and reports I can enjoy them through you. Thank you soooooooo much for your posts, they are just wonderful. Please keep them coming ! Thank you for sharing the visit to Cario and the pyramids. We look forward to each entry. Our friend, Norma Symes,, is on the cruise and we feel part of the cruise each time we read your blog. Hi Trilla! It’s Erika from Revana’s. I hope all is well with your travels! Beautiful photos of Egypt!